Once again in a few days I’ll be on the move. So the routine has begun, packing my suitcase (I hate packing! ), time to wind up the kitchen, close the house. Last minute tension, as I’ll be attending two weddings and have to make sure have all the wedding saris, jewelry etc. Always get the feeling, ‘am I forgetting something?’ However, I calm down for a few hours as I remember what my kaka (chacha, uncle) always use to say when we’d travel by flight alone to get back to boarding school. He’d say as long as you have your passport, ticket and some money, you’re fine. Traveling often, does that make me an expert at packing my suitcase? Not at all. I always land up with a couple of clothes that I’d not taken out of the suitcase, forget about wearing them. Once I travelled with the exact number of clothes and guess what, I needed an extra pair! As hubby and I globe trot, hopefully I will be able to share a bit of my travel experience with you all. Be warned, I am poor at remembering to take photos. Have you seen travelers who want that perfect photo for Instagram and in the process forget to enjoy the beauty of the place? I have, and I don’t like being that person. However, when I want to write about my travel then I realize that I don’t have photos to share! Oh well, lets see how this travel goes. What is today’s theme all about? Well, its International Carrot Day on 4th April. This day is celebrated by carrot fans by holding carrot parties or festivals. Carrot Day started in 2003, to spread the knowledge of the health benefits of including carrots in one’s daily diet. Poonam who blogs at Annapurna recommended that the FoodieMonday/Bloghop group celebrates this day by preparing a dish using carrots. Visit Poonam’s blog for a variety of vegetarian recipes and if you’re looking for any Maharashtrian dish, then her blog is the one to visit. Eat your carrots and get good eyesight. That’s the saying I’ve grown up with. Not that anyone would need to force me to eat carrots. I love how sweet, crunchy and juicy this root vegetable is. Such a versatile vegetable, use it in salads, as a filling or part of many main dishes, used in baking, used for pickling, used to make chutneys, etc. The possibilities are endless. I decided to use carrot to make carrot oatmeal cookies recipe that was long seeking attention from me. Carrot and orange is a classic combination. These cookies are not the usual crunchy type, but are the soft cake like type of cookies. What’s so great about these cookies you may think? Well, they are made from natural ingredients, haven’t used any refined sugar and they are a great alternate to unhealthy snacks. Enjoy a cookie with milk for tea or as breakfast with your coffee or tea. Filling and nutritious. So let’s get down to how to make these cookies. Sieve flour, salt and baking powder together in a bowl. Add rolled oats, raisins and walnuts. Mix well. Add egg, orange zest, honey, orange juice, melted butter and fresh ginger into a bowl. Whisk the mixture to mix. Add grated carrot and mix. Add the flour mixture. Using a spatula, fold the flour into the liquid. Don’t over mix. Chill the batter for 30 minutes in the fridge. Take about 2 tablespoonful of the cookie batter, roll it into a ball. Place the ball on a parchment lined baking tray. Flatten it slightly. Repeat steps 9 and 10 with the remaining batter. Bake the cookies for 15-18 minutes or till they become light golden in colour. Remove the cookies from the oven and place them on a wire rack to cool. Replace walnuts with any other nuts of your choice. Replace raisins with any dried fruit of your choice. Chill the batter, otherwise the cookies may spread out too much. 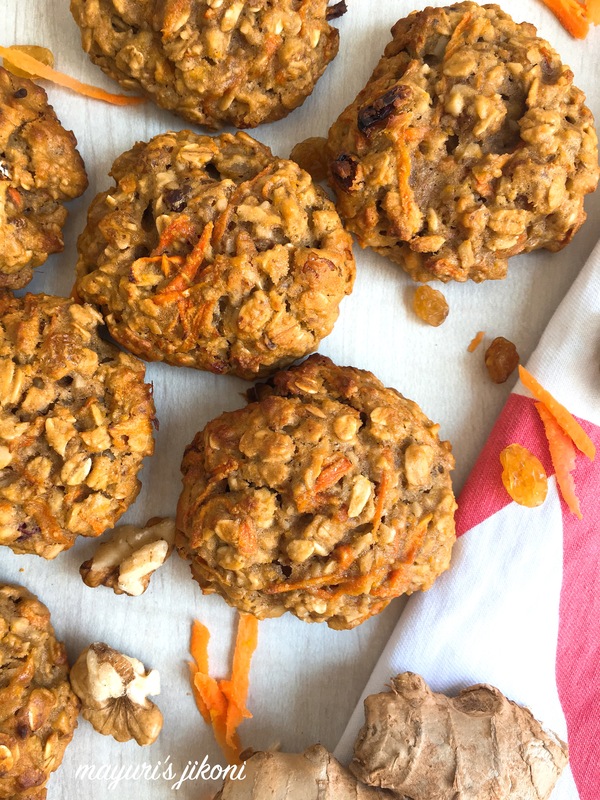 These orange flavored oatmeal cookies with walnuts and raisins sound flavorful and wholesome di ! Best part is that the recipe is refined sugar free and with whole wheat flour ! Hi Mayuri, looks like a great recipe but quick question – what can I replace the eggs with? You can replace it flax seeds.Grind 1 tbsp to a powder and add 3 tbsp water. Mix and let it rest for 10-15 minutes. Or use 1/4 cup applesauce or banana puree. Or use 1/4 cup fresh thick yogurt and add 1/2 tsp baking soda to the flour. These cookies are tempting me to pick one and take a bite!! Loved the use of all the healthy ingredients in these cookies.. the texture looks perfect!! Loved reading the first part of the post.. my dad also used to tell us till you have your ID and some money, you are good while travelling anywhere.. Enjoy the weddings and time with your loved ones.. Thank you so much Swati. I love the ingredients you have used here. I can imagine just how delicious and wholesome these cookies must have been. 🙂 Awesome recipe. These cookies sound so perfect for Easter dessert. I’m printing the recipe out right now to give them a try! Cookies with carrot oats ginger raisins and walnuts sounds amazing Mayuri. I wish I could grab one from the picture. Loved these super healthy cookies. These are some tasty-looking cookies. I’d like to make these for Easter. The kids will enjoy making them. Thanks Brianne, they are easy to make and am sure kids will have fun. These perfectly baked cookies with all the healthy ingredients looks scrumptious.These cookies will be loved by my boys for sure. Fabulous share. Wow your cookies have my attention. I love these healthy delicious cookies. Love them Mayuri great share. Thanks Veena. Please let me know how the eggless version turns out.